Major General John Enenche director of defence information while addressing the media on Friday in Abuja told citizens not to panic over the October 1st deadline given to the IPOB members by a group of Nothern youths to vacate the region. He also reassured Nigerians that the DHQ did not raid the house of the leader of the Indigenous People of Biafra (IPOB), Nnamdi Kanu and does not know his whereabouts. 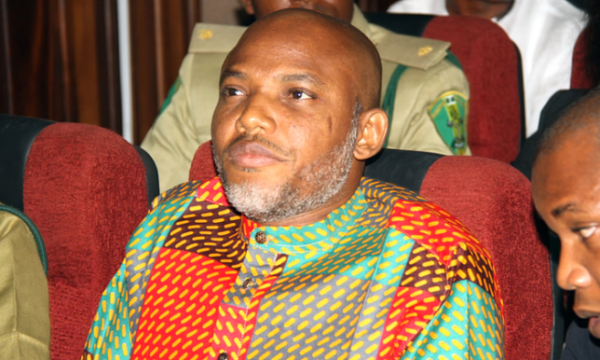 He said, contrary to reports, Kanu is not in military custody and has no idea if the military will declare him wanted. He added that the job of the military was to diagnose security issues, he also warned the public of consequences and that is part of their media operations. According to Vanguard, Enenche said contrary to the position of some people, the country was not militarized. “Other countries passed through this, if you go into history, before getting to where they are as developed countries today. Like in China, you see one policeman inside a car, you hardly see a military man outside and it depends on the developmental process and what you passed through. “That’s why in simple terms, I will tell you that we are not alarmed at all. For example, the last terrorist attack in the UK, 24 hours after the attack, the government asked the military to take over the area. If the UK government can tell the military to take over, to back up the Police, I think we are just about 100 years old of amalgamation and about 57 years old, it’s not out of place, “he stressed. He expressed disappointment over the position of some legal practitioners on military involvement in the IPOB issue just as he said some of them got it right in his assessment of various contributions to the issue. The Defence Headquarters, according to Enenche,” reaffirmed the unalloyed loyalty of the Armed Forces of Nigeria to the Commander-In-Chief of the Armed Forces of the Federal Republic of Nigeria, President Muhammadu Buhari.” It also reaffirmed total subordination of the Nigerian Military to constituted civil authorities, complete dedication of the military to its constitutional roles as well as dedication of the Armed Forces of Nigeria to the protection of lives and property of all peace loving people where ever they live in Nigeria.